These highlights do not include all the information needed to use EPIDIOLEX ® safely and effectively. See full prescribing information for EPIDIOLEX . To report SUSPECTED ADVERSE REACTIONS, contact Greenwich Biosciences at 1-833-424-6724 (1-833-GBIOSCI) or FDA at 1-800-FDA-1088 or www.fda.gov/medwatch. EPIDIOLEX is indicated for the treatment of seizures associated with Lennox-Gastaut syndrome (LGS) or Dravet syndrome (DS) in patients 2 years of age and older. Because of the risk of hepatocellular injury, obtain serum transaminases (ALT and AST) and total bilirubin levels in all patients prior to starting treatment with EPIDIOLEX [see Warnings and Precautions (5.1)]. EPIDIOLEX is to be administered orally. The starting dosage is 2.5 mg/kg twice daily (5 mg/kg/day). After one week, the dosage can be increased to a maintenance dosage of 5 mg/kg twice daily (10 mg/kg/day). Patients who are tolerating EPIDIOLEX at 5 mg/kg twice daily and require further reduction of seizures may benefit from a dosage increase up to a maximum recommended maintenance dosage of 10 mg/kg twice daily (20 mg/kg/day), in weekly increments of 2.5 mg/kg twice daily (5 mg/kg/day), as tolerated. For patients in whom a more rapid titration from 10 mg/kg/day to 20 mg/kg/day is warranted, the dosage may be increased no more frequently than every other day. Administration of the 20 mg/kg/day dosage resulted in somewhat greater reductions in seizure rates than the recommended maintenance dosage of 10 mg/kg/day, but with an increase in adverse reactions. Food may affect EPIDIOLEX levels [see Clinical Pharmacology (12.3)]. A calibrated measuring device (either 5 mL or 1 mL oral syringe) will be provided and is recommended to measure and deliver the prescribed dose accurately [see How Supplied/Storage and Handling (16.1)]. A household teaspoon or tablespoon is not an adequate measuring device. Discard any unused EPIDIOLEX remaining 12 weeks after first opening the bottle [see How Supplied/ Storage and Handling (16.2)]. When discontinuing EPIDIOLEX, the dose should be decreased gradually. As with all antiepileptic drugs, abrupt discontinuation should be avoided when possible, to minimize the risk of increased seizure frequency and status epilepticus [see Warnings and Precautions (5.5)]. Dose adjustment is recommended in patients with moderate (Child-Pugh B) hepatic impairment or severe (Child-Pugh C) hepatic impairment [see Warnings and Precautions (5.1), Use in Specific Populations (8.6), and Clinical Pharmacology (12.3)]. It may be necessary to have slower dose titration in patients with moderate or severe hepatic impairment than in patients without hepatic impairment (see Table 1). EPIDIOLEX does not require dose adjustment in patients with mild (Child-Pugh A) hepatic impairment. Cannabidiol oral solution: 100 mg/mL for oral administration. Each bottle contains 100 mL of a clear, colorless to yellow solution. EPIDIOLEX is contraindicated in patients with a history of hypersensitivity to cannabidiol or any of the ingredients in the product [see Description (11) and Warnings and Precautions (5.4)]. EPIDIOLEX causes dose-related elevations of liver transaminases (alanine aminotransferase [ALT] and/or aspartate aminotransferase [AST]). In controlled studies for LGS and DS, the incidence of ALT elevations above 3 times the upper limit of normal (ULN) was 13% in EPIDIOLEX-treated patients compared with 1% in patients on placebo. Less than 1% of EPIDIOLEX-treated patients had ALT or AST levels greater than 20 times the ULN. There were cases of transaminase elevations associated with hospitalization in patients taking EPIDIOLEX. In clinical trials, serum transaminase elevations typically occurred in the first two months of treatment initiation; however, there were some cases observed up to 18 months after initiation of treatment, particularly in patients taking concomitant valproate. Resolution of transaminase elevations occurred with discontinuation of EPIDIOLEX or reduction of EPIDIOLEX and/or concomitant valproate in about two-thirds of the cases. In about one-third of the cases, transaminase elevations resolved during continued treatment with EPIDIOLEX, without dose reduction. The majority of ALT elevations occurred in patients taking concomitant valproate [see Drug Interactions (7.3)]. Concomitant use of clobazam also increased the incidence of transaminase elevations, although to a lesser extent than valproate [see Drug Interactions (7.2)]. In EPIDIOLEX-treated patients, the incidence of ALT elevations greater than 3 times the ULN was 30% in patients taking both concomitant valproate and clobazam, 21% in patients taking concomitant valproate (without clobazam), 4% in patients taking concomitant clobazam (without valproate), and 3% in patients taking neither drug. Consider discontinuation or dose adjustment of valproate or clobazam if liver enzyme elevations occur. Transaminase elevations are dose-related. Overall, ALT elevations greater than 3 times the ULN were reported in 17% of patients taking EPIDIOLEX 20 mg/kg/day compared with 1% in patients taking EPIDIOLEX 10 mg/kg/day. Patients with baseline transaminase levels above the ULN had higher rates of transaminase elevations when taking EPIDIOLEX. In controlled trials (Studies 1, 2, and 3) in patients taking EPIDIOLEX 20 mg/kg/day, the frequency of treatment-emergent ALT elevations greater than 3 times the ULN was 30% when ALT was above the ULN at baseline, compared to 12% when ALT was within the normal range at baseline. No patients taking EPIDIOLEX 10 mg/kg/day experienced ALT elevations greater than 3 times the ULN when ALT was above the ULN at baseline, compared with 2% of patients in whom ALT was within the normal range at baseline. In general, transaminase elevations of greater than 3 times the ULN in the presence of elevated bilirubin without an alternative explanation are an important predictor of severe liver injury. Early identification of elevated liver enzymes may decrease the risk of a serious outcome. Patients with elevated baseline transaminase levels above 3 times the ULN, accompanied by elevations in bilirubin above 2 times the ULN, should be evaluated prior to initiation of EPIDIOLEX treatment. Prior to starting treatment with EPIDIOLEX, obtain serum transaminases (ALT and AST) and total bilirubin levels. Serum transaminases and total bilirubin levels should be obtained at 1 month, 3 months, and 6 months after initiation of treatment with EPIDIOLEX, and periodically thereafter or as clinically indicated. Serum transaminases and total bilirubin levels should also be obtained within 1 month following changes in EPIDIOLEX dosage and addition of or changes in medications that are known to impact the liver. Consider more frequent monitoring of serum transaminases and bilirubin in patients who are taking valproate or who have elevated liver enzymes at baseline. If a patient develops clinical signs or symptoms suggestive of hepatic dysfunction (e.g., unexplained nausea, vomiting, right upper quadrant abdominal pain, fatigue, anorexia, or jaundice and/or dark urine), promptly measure serum transaminases and total bilirubin and interrupt or discontinue treatment with EPIDIOLEX, as appropriate. Discontinue EPIDIOLEX in any patients with elevations of transaminase levels greater than 3 times the ULN and bilirubin levels greater than 2 times the ULN. Patients with sustained transaminase elevations of greater than 5 times the ULN should also have treatment discontinued. Patients with prolonged elevations of serum transaminases should be evaluated for other possible causes. Consider dosage adjustment of any co-administered medication that is known to affect the liver (e.g., valproate and clobazam). EPIDIOLEX can cause somnolence and sedation. In controlled studies for LGS and DS, the incidence of somnolence and sedation (including lethargy) was 32% in EPIDIOLEX-treated patients, compared with 11% in patients on placebo and was dose-related (34% of patients taking EPIDIOLEX 20 mg/kg/day, compared with 27% in patients taking EPIDIOLEX 10 mg/kg/day). The rate was higher in patients on concomitant clobazam (46% in EPIDIOLEX-treated patients taking clobazam compared with 16% in EPIDIOLEX-treated patients not on clobazam). In general, these effects were more common early in treatment and may diminish with continued treatment. Other CNS depressants, including alcohol, could potentiate the somnolence and sedation effect of EPIDIOLEX. Prescribers should monitor patients for somnolence and sedation and should advise patients not to drive or operate machinery until they have gained sufficient experience on EPIDIOLEX to gauge whether it adversely affects their ability to drive or operate machinery. Antiepileptic drugs (AEDs), including EPIDIOLEX, increase the risk of suicidal thoughts or behavior in patients taking these drugs for any indication. Patients treated with an AED for any indication should be monitored for the emergence or worsening of depression, suicidal thoughts or behavior, or any unusual changes in mood or behavior. Pooled analyses of 199 placebo-controlled clinical trials (mono- and adjunctive therapy) of 11 different AEDs showed that patients randomized to one of the AEDs had approximately twice the risk (adjusted Relative Risk 1.8, 95% CI:1.2, 2.7) of suicidal thinking or behavior compared to patients randomized to placebo. In these trials, which had a median treatment duration of 12 weeks, the estimated incidence rate of suicidal behavior or ideation among 27863 AED-treated patients was 0.43%, compared to 0.24% among 16029 placebo-treated patients, representing an increase of approximately one case of suicidal thinking or behavior for every 530 patients treated. There were four suicides in drug-treated patients in the trials and none in placebo-treated patients, but the number is too small to allow any conclusion about drug effect on suicide. The risk of suicidal thoughts or behavior was generally consistent among drugs in the data analyzed. The finding of increased risk with AEDs of varying mechanisms of action and across a range of indications suggests that the risk applies to all AEDs used for any indication. The risk did not vary substantially by age (5±100 years) in the clinical trials analyzed. Table 2 shows absolute and relative risk by indication for all evaluated AEDs. Anyone considering prescribing EPIDIOLEX or any other AED must balance the risk of suicidal thoughts or behaviors with the risk of untreated illness. Epilepsy and many other illnesses for which AEDs are prescribed are themselves associated with morbidity and mortality and an increased risk of suicidal thoughts and behavior. Should suicidal thoughts and behavior emerge during treatment, consider whether the emergence of these symptoms in any given patient may be related to the illness being treated. EPIDIOLEX can cause hypersensitivity reactions. One subject in the EPIDIOLEX clinical trials had pruritus, erythema, and angioedema requiring treatment with antihistamines. Patients with known or suspected hypersensitivity to any ingredients of EPIDIOLEX were excluded from the clinical trials. If a patient develops hypersensitivity reactions after treatment with EPIDIOLEX, the drug should be discontinued. EPIDIOLEX is contraindicated in patients with a prior hypersensitivity reaction to cannabidiol or any of the ingredients in the product, which includes sesame seed oil [see Description (11)]. As with most antiepileptic drugs, EPIDIOLEX should generally be withdrawn gradually because of the risk of increased seizure frequency and status epilepticus [see Dosage and Administration (2.4) and Clinical Studies (14)]. But if withdrawal is needed because of a serious adverse event, rapid discontinuation can be considered. In controlled and uncontrolled trials in patients with LGS and DS, 689 patients were treated with EPIDIOLEX, including 533 patients treated for more than 6 months, and 391 patients treated for more than 1 year. In an expanded access program and other compassionate use programs, 161 patients with DS and LGS were treated with EPIDIOLEX, including 109 patients treated for more than 6 months, 91 patients treated for more than 1 year, and 50 patients treated for more than 2 years. In placebo-controlled trials of patients with LGS or DS (includes Studies 1, 2, 3, and a Phase 2 controlled study in DS), 323 patients received EPIDIOLEX. Adverse reactions are presented below; the duration of treatment in these trials was up to 14 weeks. Approximately 46% of patients were female, 83% were Caucasian, and the mean age was 14 years (range 2 to 48 years). All patients were taking other AEDs. In controlled trials, the rate of discontinuation as a result of any adverse reaction was 2.7% for patients taking EPIDIOLEX 10 mg/kg/day, 11.8% for patients taking EPIDIOLEX 20 mg/kg/day, and 1.3% for patients on placebo. The most frequent cause of discontinuations was transaminase elevation. Discontinuation for transaminase elevation occurred at an incidence of 1.3% in patients taking EPIDIOLEX 10 mg/kg/day, 5.9% in patients taking EPIDIOLEX 20 mg/kg/day, and 0.4% in patients on placebo. Somnolence, sedation, and lethargy led to discontinuation in 3% of patients taking EPIDIOLEX 20 mg/kg/day compared to 0% of patients taking EPIDIOLEX 10 mg/kg/day or on placebo. The most common adverse reactions that occurred in EPIDIOLEX-treated patients (incidence at least 10% and greater than placebo) were somnolence; decreased appetite; diarrhea; transaminase elevations; fatigue, malaise, and asthenia; rash; insomnia, sleep disorder, and poor quality sleep; and infections. Table 3 lists the adverse reactions that were reported in ≥3% of EPIDIOLEX-treated patients, and at a rate greater than those on placebo in the placebo-controlled trials in LGS and DS. Adverse reactions were similar across LGS and DS in pediatric and adult patients. EPIDIOLEX can cause weight loss. In the controlled trials of patients with LGS or DS, based on measured weights, 16% of EPIDIOLEX-treated patients had a decrease in weight of ≥5% from their baseline weight, compared to 8% of patients on placebo. The decrease in weight appeared to be dose-related, with 18% of patients on EPIDIOLEX 20 mg/kg/day experiencing a decrease in weight ≥5%, compared to 9% in patients on EPIDIOLEX 10 mg/kg/day. In some cases, the decreased weight was reported as an adverse event (see Table 3). EPIDIOLEX can cause decreases in hemoglobin and hematocrit. In controlled trials of patients with LGS or DS, the mean decrease in hemoglobin from baseline to end of treatment was -0.42 g/dL in EPIDIOLEX-treated patients and -0.03 g/dL in patients on placebo. A corresponding decrease in hematocrit was also observed, with a mean change of -1.5% in EPIDIOLEX-treated patients, and -0.4% in patients on placebo. There was no effect on red blood cell indices. Thirty percent (30%) of EPIDIOLEX-treated patients developed a new laboratory-defined anemia during the course of the study (defined as a normal hemoglobin concentration at baseline, with a reported value less than the lower limit of normal at a subsequent time point), versus 13% of patients on placebo. EPIDIOLEX can cause elevations in serum creatinine. The mechanism has not been determined. In controlled studies in healthy adults and in patients with LGS and DS, an increase in serum creatinine of approximately 10% was observed within 2 weeks of starting EPIDIOLEX. The increase was reversible in healthy adults. Reversibility was not assessed in studies in LGS and DS. EPIDIOLEX is metabolized by CYP3A4 and CYP2C19. Therefore, coadministration with a moderate or strong inhibitor of CYP3A4 or CYP2C19 will increase cannabidiol plasma concentrations, which may result in a greater risk of adverse reactions [see Clinical Pharmacology (12.3)]. Consider a reduction in EPIDIOLEX dosage when coadministered with a moderate or strong inhibitor of CYP3A4 or CYP2C19. Coadministration with a strong CYP3A4 or CYP2C19 inducer will decrease cannabidiol plasma concentrations, which may lower the efficacy of EPIDIOLEX [see Clinical Pharmacology (12.3)]. Consider an increase in EPIDIOLEX dosage (based on clinical response and tolerability) when coadministered with a strong CYP3A4 or CYP2C19 inducer. In vitro data predict drug-drug interactions with CYP1A2 substrates (e.g., theophylline, caffeine), CYP2B6 substrates (e.g., bupropion, efavirenz), uridine 5' diphospho-glucuronosyltransferase 1A9 (UGT1A9) (e.g., diflunisal, propofol, fenofibrate), and UGT2B7 (e.g., gemfibrozil, lamotrigine, morphine, lorazepam) when coadministered with EPIDIOLEX. Coadministration of EPIDIOLEX is also predicted to cause clinically significant interactions with CYP2C8 and CYP2C9 (e.g., phenytoin) substrates. Because of potential inhibition of enzyme activity, consider a reduction in dosage of substrates of UGT1A9, UGT2B7, CYP2C8, and CYP2C9, as clinically appropriate, if adverse reactions are experienced when administered concomitantly with EPIDIOLEX. Because of potential for both induction and inhibition of enzyme activity, consider adjusting dosage of substrates of CYP1A2 and CYP2B6, as clinically appropriate. In vivo data show that coadministration of EPIDIOLEX increases plasma concentrations of drugs that are metabolized by (i.e., are substrates of) CYP2C19 (e.g., diazepam) and may increase the risk of adverse reactions with these substrates [see Clinical Pharmacology (12.3)]. Consider a reduction in dosage of sensitive CYP2C19 substrates, as clinically appropriate, when coadministered with EPIDIOLEX. Coadministration of EPIDIOLEX produces a 3-fold increase in plasma concentrations of N-desmethylclobazam, the active metabolite of clobazam (a substrate of CYP2C19) [see Clinical Pharmacology (12.3)]. This may increase the risk of clobazam-related adverse reactions [see Warnings and Precautions (5.1, 5.2)]. Consider a reduction in dosage of clobazam if adverse reactions known to occur with clobazam are experienced when co-administered with EPIDIOLEX. Concomitant use of EPIDIOLEX and valproate increases the incidence of liver enzyme elevations [see Warnings and Precautions (5.1)]. Discontinuation or reduction of EPIDIOLEX and/or concomitant valproate should be considered. Insufficient data are available to assess the risk of concomitant administration of other hepatotoxic drugs and EPIDIOLEX. Concomitant use of EPIDIOLEX with other CNS depressants may increase the risk of sedation and somnolence [see Warnings and Precautions (5.2)]. There is a pregnancy exposure registry that monitors pregnancy outcomes in women exposed to antiepileptic drugs (AEDs), such as EPIDIOLEX, during pregnancy. Encourage women who are taking EPIDIOLEX during pregnancy to enroll in the North American Antiepileptic Drug (NAAED) Pregnancy Registry by calling the toll free number 1-888-233-2334 or visiting http://www.aedpregnancyregistry.org/. There are no adequate data on the developmental risks associated with the use of EPIDIOLEX in pregnant women. Administration of cannabidiol to pregnant animals produced evidence of developmental toxicity (increased embryofetal mortality in rats and decreased fetal body weights in rabbits; decreased growth, delayed sexual maturation, long-term neurobehavioral changes, and adverse effects on the reproductive system in rat offspring) at maternal plasma exposures similar to (rabbit) or greater than (rat) that in humans at therapeutic doses (see Animal Data). In the U.S. general population, the estimated background risk of major birth defects and miscarriage in clinically recognized pregnancies is 2–4% and 15–20%, respectively. The background risks of major birth defects and miscarriage for the indicated populations are unknown. Oral administration of cannabidiol (0, 75, 150, or 250 mg/kg/day) to pregnant rats throughout the period of organogenesis resulted in embryofetal mortality at the highest dose tested. There were no other drug-related maternal or developmental effects. The highest no-effect dose for embryofetal toxicity in rats was associated with maternal plasma cannabidiol exposures (AUC) approximately 16 times that in humans at the recommended human dose (RHD) of 20 mg/kg/day. Oral administration of cannabidiol (0, 50, 80, or 125 mg/kg/day) to pregnant rabbits throughout organogenesis resulted in decreased fetal body weights and increased fetal structural variations at the highest dose tested, which was also associated with maternal toxicity. Maternal plasma cannabidiol exposures at the no-effect level for embryofetal developmental toxicity in rabbits were less than that in humans at the RHD. When cannabidiol (75, 150, or 250 mg/kg/day) was orally administered to rats throughout pregnancy and lactation, decreased growth, delayed sexual maturation, neurobehavioral changes (decreased activity), and adverse effects on male reproductive organ development (small testes in adult offspring) and fertility were observed in the offspring at the mid and high dose. These effects occurred in the absence of maternal toxicity. The no-effect dose for pre- and postnatal developmental toxicity in rats was associated with maternal plasma cannabidiol exposures approximately 9 times that in humans at the RHD. There are no data on the presence of cannabidiol or its metabolites in human milk, the effects on the breastfed infant, or the effects on milk production. The developmental and health benefits of breastfeeding should be considered along with the mother’s clinical need for EPIDIOLEX and any potential adverse effects on the breastfed infant from EPIDIOLEX or from the underlying maternal condition. Safety and effectiveness of EPIDIOLEX for the treatment of seizures associated with Lennox-Gastaut syndrome or Dravet syndrome have been established in patients 2 years of age and older. Safety and effectiveness of EPIDIOLEX in pediatric patients below 2 years of age have not been established. Administration of cannabidiol (subcutaneous doses of 0 or 15 mg/kg on Postnatal Days (PNDs) 4-6 followed by oral administration of 0, 100, 150, or 250 mg/kg on PNDs 7-77) to juvenile rats for 10 weeks resulted in increased body weight, delayed male sexual maturation, neurobehavioral effects (decreased locomotor activity and auditory startle habituation), increased bone mineral density, and liver hepatocyte vacuolation. A no-effect dose was not established. The lowest dose causing developmental toxicity in juvenile rats (15 sc/100 po mg/kg) was associated with cannabidiol exposures approximately 30 times that in humans at the recommended dose of 20 mg/kg/day. Clinical trials of EPIDIOLEX in the treatment of LGS and DS did not include any patients aged above 55 years to determine whether or not they respond differently from younger patients. In general, dose selection for an elderly patient should be cautious, usually starting at the low end of the dosing range, reflecting the greater frequency of decreased hepatic, renal, or cardiac function, and of concomitant disease or other drug therapy [see Dosage and Administration (2.5), Warnings and Precautions (5.1), and Clinical Pharmacology (12.3)]. Because of an increase in exposure to EPIDIOLEX, dosage adjustments are necessary in patients with moderate or severe hepatic impairment [see Dosage and Administration (2.5), Warnings and Precautions (5.1), and Clinical Pharmacology (12.3)]. EPIDIOLEX does not require dosage adjustments in patients with mild hepatic impairment. EPIDIOLEX is controlled in Schedule V of the Controlled Substance Act. Animal abuse-related studies show that cannabidiol does not produce cannabinoid-like behavioral responses, including generalization to delta-9-tetrahydrocannabinol (THC) in a drug discrimination study. Cannabidiol also does not produce animal self-administration, suggesting it does not produce rewarding effects. In a human abuse potential study, acute administration of cannabidiol to non-dependent adult recreational drug users at therapeutic and supratherapeutic doses of 750, 1500, and 4500 mg in the fasted state (equivalent respectively to 10, 20, and 60 mg/kg in a 75 kg adult) produced responses on positive subjective measures such as Drug Liking and Take Drug Again that were within the acceptable placebo range. In contrast, 10 and 30 mg of dronabinol (synthetic THC) and 2 mg alprazolam produced large increases on positive subjective measures compared to placebo that were statistically significantly greater than those produced by cannabidiol. In other Phase 1 clinical studies conducted with cannabidiol, there were no reports of abuse-related adverse events. In a human physical dependence study, administration of cannabidiol 1500 mg/day (750 mg twice daily) to adults for 28 days did not produce signs or symptoms of withdrawal over a 6-week assessment period beginning three days after drug discontinuation. This suggests that cannabidiol likely does not produce physical dependence. Cannabidiol, the active ingredient in EPIDIOLEX, is a cannabinoid that naturally occurs in the Cannabis sativa L. plant. Cannabidiol is a white to pale yellow crystalline solid. It is insoluble in water and is soluble in organic solvents. EPIDIOLEX (cannabidiol) oral solution is a clear, colorless to yellow liquid containing cannabidiol at a concentration of 100 mg/mL. Inactive ingredients include dehydrated alcohol, sesame seed oil, strawberry flavor, and sucralose. EPIDIOLEX contains no ingredient made from a gluten-containing grain (wheat, barley, or rye). The precise mechanisms by which EPIDIOLEX exerts its anticonvulsant effect in humans are unknown. Cannabidiol does not appear to exert its anticonvulsant effects through interaction with cannabinoid receptors. There are no relevant data on the pharmacodynamic effects of cannabidiol. Cannabidiol demonstrated an increase in exposure that was less than dose-proportional over the range of 5 to 20 mg/kg/day in patients. Cannabidiol has a time to maximum plasma concentration (Tmax) of 2.5 to 5 hours at steady state (Css). Coadministration of EPIDIOLEX with a high-fat/high-calorie meal increased Cmax by 5-fold, AUC by 4-fold, and reduced the total variability, compared with the fasted state in healthy volunteers [see Dosage and Administration (2.2)]. The apparent volume of distribution in healthy volunteers was 20963 L to 42849 L. Protein binding of the cannabidiol and its metabolites was >94% in vitro. The half-life of cannabidiol in plasma was 56 to 61 hours after twice-daily dosing for 7 days in healthy volunteers. The plasma clearance of cannabidiol following a single EPIDIOLEX 1500 mg dose (1.1 times the maximum recommended daily dosage) is 1111 L/h. Cannabidiol is metabolized in the liver and the gut (primarily in the liver) by CYP2C19 and CYP3A4 enzymes, and UGT1A7, UGT1A9, and UGT2B7 isoforms. After repeat dosing, the active metabolite of cannabidiol, 7-OH-CBD, has a 38% lower AUC than the parent drug. The 7-OH-CBD metabolite is converted to 7-COOH-CBD, which has an approximately 40-fold higher AUC than the parent drug. Based on preclinical models of seizure, the 7-OH-CBD metabolite is active; however, the 7-COOH-CBD metabolite is not active. EPIDIOLEX is excreted in feces, with minor renal clearance. No effects on the exposures of cannabidiol or metabolite exposures were observed following administration of a single dose of EPIDIOLEX 200 mg in patients with mild (Child-Pugh A) hepatic impairment. Patients with moderate (Child-Pugh B) or severe (Child-Pugh C) hepatic impairment had an approximately 2.5 to 5.2-fold higher AUC, compared with healthy volunteers with normal hepatic function [see Dosage and Administration (2.5), Warnings and Precautions (5.1), Use in Specific Populations (8.6)]. Cannabidiol is a substrate for cytochrome p450 (CYP) enzymes CYP3A4 and CYP2C19. Cannabidiol has the potential to inhibit CYP2C8, CYP2C9, and CYP2C19 at clinically relevant concentrations. Cannabidiol may induce or inhibit CYP1A2 and CYP2B6 at clinically relevant concentrations. Cannabidiol inhibits uridine 5'-diphospho-glucuronosyltransferase (UGT) enzymes UGT1A9 and UGT2B7, but does not inhibit the UGT1A1, UGT1A3, UGT1A4, UGT1A6, or UGT2B17 isoforms. Cannabidiol and the cannabidiol metabolite, 7-OH-CBD, are not anticipated to interact with BCRP, BSEP, MDR1/P-pg, OAT1, OAT3, OCT1, OCT2, MATE1, MATE2-K, OATP1B1, or OATP1B3. The cannabidiol metabolite, 7-COOH-CBD, is not a substrate of BCRP, OATP1B1, OATP1B3, or OCT1. However, 7-COOH-CBD is a substrate for P-gp. 7-COOH-CBD is an inhibitor of transport mediated via BCRP and BSEP at clinically relevant concentrations. The interaction potential with other AEDs (clobazam and valproate) was evaluated in dedicated clinical studies following coadministration of EPIDIOLEX (750 mg twice daily in healthy volunteers and 20 mg/kg/day in patients). Coadministration with clobazam in healthy volunteers increased the cannabidiol active metabolite 7-OH CBD mean Cmax by 73% and AUC by 47%; and increased the clobazam active metabolite, N-desmethylclobazam, Cmax and AUC by approximately 3-fold [see Drug Interactions (7.2)]. When EPIDIOLEX was coadministered with valproate, there was no effect on valproate exposure. Coadministration of EPIDIOLEX with midazolam (a sensitive CYP3A4 substrate) did not result in changes in plasma concentrations of midazolam compared to midazolam administered alone. Adequate studies of the carcinogenic potential of cannabidiol have not been conducted. Cannabidiol was negative for genotoxicity in in vitro (Ames) and in vivo (rat Comet and bone marrow micronucleus) assays. Oral administration of cannabidiol (0, 75, 150, or 250 mg/kg/day) to male and female rats, prior to and throughout mating and continuing in females during early gestation, produced no adverse effects on fertility. The highest dose tested was associated with plasma exposures approximately 60 times that in humans at the maximum recommended human dose (20 mg/kg/day). The effectiveness of EPIDIOLEX for the treatment of seizures associated with LGS was established in two randomized, double-blind, placebo-controlled trials in patients aged 2 to 55 years. Study 1 (N=171) compared a dose of EPIDIOLEX 20 mg/kg/day with placebo. Study 2 (N=225) compared a 10 mg/kg/day dose and a 20 mg/kg/day dose of EPIDIOLEX with placebo. In both studies, patients had a diagnosis of LGS and were inadequately controlled on at least one AED, with or without vagal nerve stimulation and/or ketogenic diet. Both trials had a 4-week baseline period, during which patients were required to have a minimum of 8 drop seizures (≥2 drop seizures per week). The baseline period was followed by a 2-week titration period and a 12-week maintenance period. In Study 1, 94% of patients were taking at least 2 concomitant AEDs. The most frequently used concomitant AEDs (>25%) in Study 1 were clobazam (49%), valproate (40%), lamotrigine (37%), levetiracetam (34%), and rufinamide (27%). In Study 2, 94% of patients were taking at least 2 concomitant AEDs. The most frequently used concomitant AEDs (>25%) in Study 2, were clobazam (49%), valproate (38%), levetiracetam (31%), lamotrigine (30%), and rufinamide (29%). The primary efficacy measure in both studies was the percent change from baseline in the frequency (per 28 days) of drop seizures (atonic, tonic, or tonic-clonic seizures) over the 14-week treatment period. Key secondary endpoints in both studies included analyses of change in total seizure frequency and changes from baseline in the Subject/Caregiver Global Impression of Change (S/CGIC) score at the last visit. For the S/CGIC, the following question was rated on a 7-point scale: “Since [you/your child] started treatment, please assess the status of [your/your child’s] overall condition (comparing [your/their] condition now to [your/their] condition before treatment) using the scale below.” The 7-point scale was as follows: “Very Much Improved” (1); “Much Improved” (2); “Slightly Improved” (3); “No Change” (4); “Slightly Worse” (5); “Much Worse” (6); “Very Much Worse” (7). In Studies 1 and 2, the median percent change from baseline (reduction) in the frequency of drop seizures was significantly greater for both dosage groups of EPIDIOLEX than for placebo (Table 4). A reduction in drop seizures was observed within 4 weeks of initiating treatment with EPIDIOLEX, and the effect remained generally consistent over the 14-week treatment period. Figure 1 displays the percentage of patients by category of reduction from baseline in drop seizure frequency per 28 days during the treatment period in Study 1. Figure 2 displays the percentage of patients by category of reduction from baseline in drop seizure frequency (per 28 days) during the treatment period in Study 2. In Study 1, 3 of 85 (4%) patients in the EPIDIOLEX 20 mg/kg/day group reported no drop seizures during the maintenance period, compared to 0 patients in the placebo group. In Study 2, 3 of 73 (4%) patients in the EPIDIOLEX 10 mg/kg/day group, 5 of 76 (7%) patients in the EPIDIOLEX 20 mg/kg/day group, and 1 of 76 (1%) patients in the placebo group reported no drop seizures during the maintenance period. In LGS patients, EPIDIOLEX was associated with significant reductions in total seizure frequency (drop and non-drop seizures) versus placebo. During the treatment period in Study 1, the median percent reduction in total seizure frequency (per 28 days) was 41% in patients taking EPIDIOLEX 20 mg/kg/day compared to 14% in patients taking placebo (p<0.01). In Study 2, the median percent reduction in total seizure frequency (per 28 days) was 36% in the 10 mg/kg/day group, 38% in the 20 mg/kg/day group, and 18% in the placebo group (p<0.01 for both groups). A greater improvement on the Subject/Caregiver Global Impression of Change (S/CGIC) was reported in patients treated with EPIDIOLEX compared with placebo in Studies 1 and 2. In Study 1, the mean S/CGIC score at last visit was 3.0 in the 20 mg/kg/day EPIDIOLEX group (corresponding to “slightly improved”) compared with 3.7 (most closely associated with “no change”) in the placebo group (p<0.01). In Study 2, the mean S/CGIC score at last visit was 3.0 and 3.2 in the 10 mg/kg/day and 20 mg/kg/day EPIDIOLEX groups, respectively (“slightly improved”), compared with 3.6 (“no change”) in the placebo group (p<0.01 and p=0.04, respectively). The effectiveness of EPIDIOLEX for the treatment of seizures associated with DS was demonstrated in a single randomized, double-blind, placebo-controlled trial in 120 patients aged 2 to 18 years. Study 3 compared a dose of EPIDIOLEX 20 mg/kg/day with placebo. Patients had a diagnosis of treatment-resistant DS and were inadequately controlled with at least one concomitant AED, with or without vagal nerve stimulation or ketogenic diet. During the 4-week baseline period, patients were required to have at least 4 convulsive seizures while on stable AED therapy. The baseline period was followed by a 2-week titration period and a 12-week maintenance period. The primary efficacy measure was the percent change from baseline in the frequency (per 28 days) of convulsive seizures (all countable atonic, tonic, clonic, and tonic-clonic seizures) over the 14-week treatment period. In Study 3, 93% of patients were taking at least 2 concomitant AEDs during the trial. The most commonly used concomitant AEDs (>25%) in Study 3 were clobazam (65%), valproate (57%), stiripentol (43%), levetiracetam (28%), and topiramate (26%). The baseline median convulsive seizure frequency was 13 per 28 days for the combined groups. The median percent change from baseline (reduction) in the frequency of convulsive seizures was significantly greater for EPIDIOLEX 20 mg/kg/day than for placebo (see Table 5). A reduction in convulsive seizures was observed within 4 weeks of initiating treatment with EPIDIOLEX and the effect remained generally consistent over the 14-week treatment period. Figure 3 displays the percentage of patients by category of reduction from baseline in convulsive seizure frequency (per 28 days) during the treatment period in Study 3. In Study 3, 4 of 60 (6.7%) patients treated with EPIDIOLEX 20 mg/kg/day reported no convulsive seizures during the maintenance period, compared to 0 patients in the placebo group. EPIDIOLEX is a strawberry flavored clear, colorless to yellow solution supplied in a 105 mL amber glass bottle with a child-resistant closure containing 100 mL of oral solution (NDC 70127-100-01). Each mL contains 100 mg of cannabidiol. EPIDIOLEX is packaged in a carton with two 5 mL calibrated oral dosing syringes and a bottle adapter (NDC 70127-100-10). 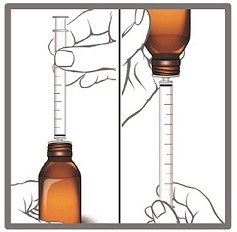 The pharmacy will provide 1 mL calibrated oral dosing syringes when doses less than 1 mL are required. Store EPIDIOLEX in an upright position at 20°C to 25°C (68°F to 77°F); excursions are permitted between 15°C to 30°C (59°F to 86°F). [See USP Controlled Room Temperature]. Do not freeze. Keep the cap tightly closed. Use within 12 weeks of first opening the bottle, then discard any remainder. Advise the caregiver or patient to read the FDA-approved patient labeling (Medication Guide and Instructions for Use). 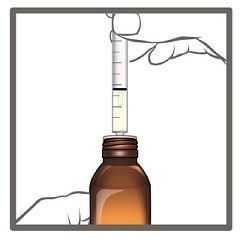 Advise patients who are prescribed EPIDIOLEX to use the adapter and oral dosing syringes provided [see Dosage and Administrationn (2.3) and Instructions for Use]. Instruct patients to discard any unused EPIDIOLEX oral solution after 12 weeks of first opening the bottle [see Dosage and Administration (2.3)]. Inform patients about the potential for elevations of liver enzymes. Discuss with the patient the importance of measuring hepatic laboratory values and having them evaluated by the healthcare provider before treatment with EPIDIOLEX and periodically during treatment [see Warnings and Precautions (5.1)]. Advise patients of the clinical signs or symptoms suggestive of hepatic dysfunction (e.g., unexplained nausea, vomiting, abdominal pain, fatigue, anorexia, or jaundice and/or dark urine) and to contact a healthcare provider promptly if these signs or symptoms occur. Caution patients about operating hazardous machinery, including motor vehicles, until they are reasonably certain that EPIDIOLEX does not affect them adversely (e.g., impair judgment, thinking or motor skills) [see Warnings and Precautions (5.2)]. Counsel patients, their caregivers, and their families that antiepileptic drugs, including EPIDIOLEX, may increase the risk of suicidal thoughts and behavior and advise them to be alert for the emergence or worsening of symptoms of depression, any unusual changes in mood or behavior, or the emergence of suicidal thoughts, behavior, or thoughts of self-harm. Instruct patients, caregivers, and families to report behaviors of concern immediately to healthcare providers [see Warnings and Precautions (5.3)]. Advise patients not to discontinue use of EPIDIOLEX without consulting with their healthcare provider. EPIDIOLEX should normally be gradually withdrawn to reduce the potential for increased seizure frequency and status epilepticus [see Dosage and Administration (2.4), Warnings and Precautions (5.4)]. Advise patients to notify their healthcare provider if they become pregnant or intend to become pregnant during EPIDIOLEX therapy. Encourage women who are taking EPIDIOLEX to enroll in the North American Antiepileptic Drug (NAAED) Pregnancy Registry if they become pregnant. This registry is collecting information about the safety of antiepileptic drugs during pregnancy [see Use in Specific Populations (8.1)]. Advise patients of the potential for positive cannabis drug screens. © 2018 Greenwich Biosciences, Inc. All rights reserved. Read this Medication Guide before you start taking EPIDIOLEX and each time you get a refill. There may be new information. This information does not take the place of talking to your healthcare provider about your medical condition or treatment. What is the most important information I should know about EPIDIOLEX? 2. EPIDIOLEX may cause you to feel sleepy, which may get better over time. Other medicines (e.g., clobazam) or alcohol may increase sleepiness. Do not drive, operate heavy machinery, or do other dangerous activities until you know how EPIDIOLEX affects you. 3. Like other antiepileptic drugs, EPIDIOLEX may cause suicidal thoughts or actions in a very small number of people, about 1 in 500. 4. Do not stop taking EPIDIOLEX without first talking to your healthcare provider. Stopping a seizure medicine such as EPIDIOLEX suddenly can cause you to have seizures more often or seizures that do not stop (status epilepticus). EPIDIOLEX is a prescription medicine that is used to treat seizures associated with Lennox-Gastaut syndrome or Dravet syndrome in people 2 years of age and older. EPIDIOLEX is controlled in Schedule V of the Controlled Substances Act. Keep EPIDIOLEX in a safe place to prevent misuse and abuse. Selling or giving away EPIDIOLEX is against the law. It is not known if EPIDIOLEX is safe and effective in children under 2 years of age. Who should not take EPIDIOLEX? Do not take EPIDIOLEX if you are allergic to cannabidiol or any of the ingredients in EPIDIOLEX. See the end of this Medication Guide for a complete list of ingredients in EPIDIOLEX. have abused or been dependent on prescription medicines, street drugs or alcohol. are pregnant or plan to become pregnant. Tell your healthcare provider right away if you become pregnant while taking EPIDIOLEX. You and your healthcare provider will decide if you should take EPIDIOLEX while you are pregnant. ○ If you become pregnant while taking EPIDIOLEX, talk to your healthcare provider about registering with the North American Antiepileptic Drug Pregnancy Registry. You can enroll in this registry by calling 1-888-233-2334. The purpose of this registry is to collect information about the safety of antiepileptic medicines during pregnancy. are breastfeeding or plan to breastfeed. It is not known if EPIDIOLEX passes into your breast milk. Talk to your healthcare provider about the best way to feed your baby while taking EPIDIOLEX. Tell your healthcare provider about all the medicines you take, including prescription and over-the-counter medicines, vitamins, herbal supplements, and any cannabis-based products. EPIDIOLEX may affect the way other medicines work, and other medicines may affect how EPIDIOLEX works. Do not start or stop taking other medicines without talking to your healthcare provider. Know the medicines you take. Keep a list of them to show your healthcare provider and pharmacist when you get a new medicine. Tell your healthcare provider if you are planning to have a cannabis drug screen because EPIDIOLEX may affect your test results. Tell the person giving the drug test that you are taking EPIDIOLEX. How should I take EPIDIOLEX? 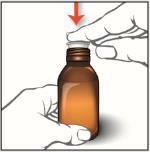 Read the Instructions for Use at the end of this Medication Guide for information on the right way to use EPIDIOLEX. Take EPIDIOLEX exactly as your healthcare provider tells you. Your healthcare provider will tell you how much EPIDIOLEX to take and when to take it. Measure each dose of EPIDIOLEX using the bottle adapter and 5 mL dosing syringes that come with EPIDIOLEX. If your dose of EPIDIOLEX is less than 1 mL, your pharmacist will provide you with 1 mL syringes to take your medicine. Use a dry syringe each time you take EPIDIOLEX. If water is inside the syringe, it could cause the oil based medicine to look cloudy. What should I avoid while taking EPIDIOLEX? Do not drive, operate heavy machinery, or do other dangerous activities until you know how EPIDIOLEX affects you. EPIDIOLEX may cause you to feel sleepy. What are the possible side effects of EPIDIOLEX? These are not all of the possible side effects of EPIDIOLEX. For more information ask your healthcare provider or pharmacist. You may also contact Greenwich Biosciences at 1-833-424-6724 (1-833-GBIOSCI). How should I store EPIDIOLEX? Store EPIDIOLEX at room temperature between 68ºF to 77ºF (20ºC to 25ºC). Always store EPIDIOLEX in an upright position. Keep the child-resistant cap tightly closed. Use EPIDIOLEX within 12 weeks of first opening the bottle. Throw away (dispose of) any unused medicine after 12 weeks. Keep EPIDIOLEX and all medicines out of the reach of children. General Information about the safe and effective use of EPIDIOLEX. Medicines are sometimes prescribed for purposes other than those listed in a Medication Guide. Do not use EPIDIOLEX for a condition for which it was not prescribed. Do not give EPIDIOLEX to other people, even if they have the same symptoms that you have. It may harm them. You can ask your pharmacist or healthcare provider for information about EPIDIOLEX that is written for health professionals. What are the ingredients in EPIDIOLEX? EPIDIOLEX does not contain gluten (wheat, barley or rye). For more information, go to www.EPIDIOLEX.com or call 1-833-424-6724 (1-833-GBIOSCI). Be sure that you read, understand and follow these instructions carefully to ensure proper dosing of the oral solution. Follow your healthcare provider’s instructions for the dose of EPIDIOLEX to take or give. Ask your healthcare provider or pharmacist if you are not sure how to prepare, take, or give the prescribed dose of EPIDIOLEX. Always use the oral syringe provided with EPIDIOLEX to make sure you measure the right amount of EPIDIOLEX. Do not use EPIDIOLEX after the expiration date on the package and each bottle. Use EPIDIOLEX within 12 weeks of first opening the bottle. After 12 weeks, safely throw away (dispose of) any EPIDIOLEX that has not been used. If your dose of EPIDIOLEX is less than 1 mL, your pharmacist will provide you with 1 mL syringes to take your medicine. Call your pharmacist right away if your dose of EPIDIOLEX is less than 1 mL and you do not receive 1 mL syringes with your medicine. Note: If you lose or damage an oral syringe, or cannot read the markings, use the spare syringe. 1. Remove the child-resistant cap by pushing down while turning the cap to the left (counter-clockwise). 2. Push the bottle adapter firmly into the bottle. Make sure the bottle adapter is fully inserted. If not fully inserted, small parts such as the bottle adapter may become a choking hazard for children and pets. Note: Do not remove the bottle adapter from the bottle after it is inserted. Your healthcare provider will tell you how much EPIDIOLEX to take or give. 3. Use this table to measure the total dose of EPIDIOLEX to be given. 4. Push the plunger all the way down and insert the tip of the oral syringe fully into the bottle adapter. With the oral syringe in place, turn the bottle upside down. 5. Slowly pull the plunger of the oral syringe to withdraw the dose of EPIDIOLEX needed. See Step 3 for how to measure the total dose of EPIDIOLEX. Line up the end of the plunger with the marking for your dose of EPIDIOLEX. If there are air bubbles in the oral syringe, keep the bottle upside down and push the plunger so that all of the liquid flows back into the bottle. Repeat Step 5 until the air bubbles are gone. 6. When you have measured the correct dose of EPIDIOLEX, leave the oral syringe in the bottle adapter and turn the bottle right side up. 7. Carefully remove the oral syringe from the bottle adapter. 8. 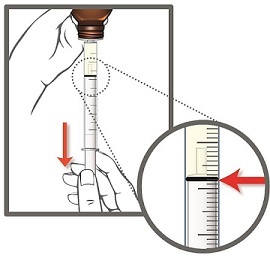 Place the tip of the oral syringe against the inside of the cheek and gently push the plunger until all the EPIDIOLEX in the syringe is given. Do not direct the medicine to the back of the mouth or throat. This may cause choking. If the dose of EPIDIOLEX prescribed by the healthcare provider is more than 5 mL, repeat steps 4 through 8 to complete the dose. If your dose of EPIDIOLEX is 8 mL, withdraw 5 mL of medicine into the syringe and give the medicine. 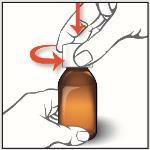 Insert the tip of the oral syringe back into the bottle adapter and withdraw 3 mL of medicine. Give the medicine to receive a total dose of 8 mL. 9. Screw the child-resistant cap back on the bottle tightly by turning the cap to the right (clockwise). Do not remove the bottle adapter. The cap will fit over it. 10. Fill a cup with warm soapy water and clean the oral syringe by drawing water in and out of the syringe using the plunger. 11. 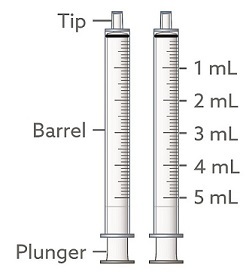 Remove the plunger from the barrel of the oral syringe and rinse both parts under tap water. 12. Shake off any extra water from the plunger and oral syringe barrel, and allow them to air dry until next use. Make sure the oral syringe is completely dry before the next use. If water is inside the syringe, it could cause the oil based medicine to look cloudy. Do not throw away the oral syringe. Store EPIDIOLEX at room temperature between 68°F to 77°F (20°C to 25°C). Use EPIDIOLEX within 12 weeks of first opening the bottle. Dispose of any unused EPIDIOLEX after 12 weeks. For additional assistance, call the toll-free helpline at 1-833-426-4243 (1-833-GBNGAGE). Q: What if there are air bubbles in the oral syringe? A: Push the liquid back into the bottle and repeat Step 5 until the air bubbles are gone. Q: What should I do if the liquid in the bottle has turned cloudy? A: The liquid in the bottle may turn cloudy if water gets in the bottle. This does not change the safety or how well the medicine works. Continue to use the cloudy liquid as prescribed by your healthcare provider. Always make sure the oral syringes are completely dry before each use. Q: What should I do if the oral syringe is not completely dry before use? A: If the oral syringe is not completely dry, use the spare syringe provided in the pack.